Printmaker Rajinder Kaur’s artistic journey is defined by the image of the sewing machine, an ode to her mother, Gurmeet Kaur, who is a seamstress and pillar of strength and support for her artist daughter. Rajinder’s starting point as an artist is her immediate environment, her home and her mother, the centre of her life and art. And it’s her mother’s journey, linked with her own, as a daughter and artist, that Rajinder expresses in the exhibition, ‘Stitch In Time’, organised by the Punjab Lalit Kala Akademi. As many as 40 works, done over the last eight years, are exhibited using various techniques of printmaking. The exhibition, says the artist, is a dream come true — a validation of her mother’s struggles and her own passion and commitment towards her work. “The possibility of it all, and in the process discovering so much about yourself and your work, is fulfilling,” says Rajinder, who has a masters degree in fine arts (Printmaking, 2015) from the Government College of Art, Chandigarh. Rajinder’s machinery and tools she used to sew and stitch, became her constant companions. Her education was single-handedly supported by her mother, so the references that the artist has included express her admiration and appreciation for her mother and her dignity of labour. In many works Rajinder is seen studying and drawing in her mother’s workshop as a little girl and later as a young woman. “It was my first classroom and continues to be,” she says. The finesse and intricate stitching work involved with tailoring helped Rajinder to devise practices which helped her develop a visual language that is gradually becoming a recurring leitmotif in her works. Rajinder draws inspiration from the intimacy that a small stitching machine allows between the human being and its user, which slowly grows into a bond between elements such as threads, needles, measuring tape, scissors, cloth, hangers and people. The measuring tape, depicted in many works,is close to the artist’s heart — she uses it in varied ways and colours. Skillful and intelligent, the use of these metaphors allows Rajinder to draw attention to the uneven world that we live in and the valiant efforts of those who resist the socio-economic pressures and negotiate challenges. The arrangement of forms reveals emotions resting in the recesses of complicated thought processes — subtle, delicate and bustling with energy at the same time. 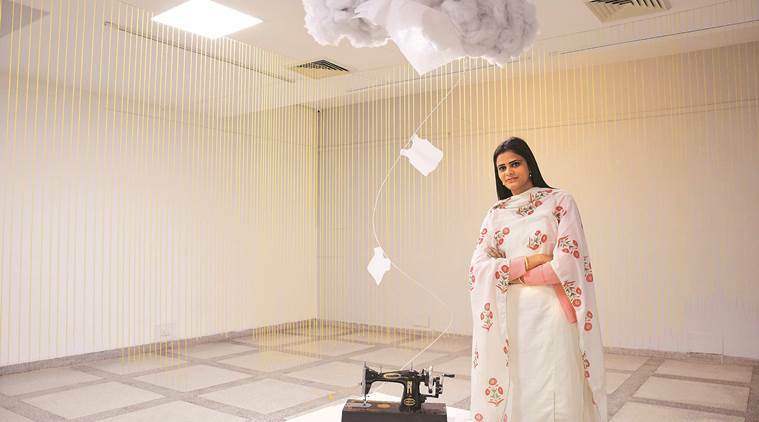 In a striking installation, using a sewing machine, clothes of paper tied to a thread which is linked with a cloud created with cotton in the sky created by her, describes the artist’s feelings of reaching her goals. “My mother is always so excited about my new work. She still stitches suits for us. Now I hope to start work on a new series, based on the Pulwama attack,which has really affected me,” says Rajinder. As a woman, Rajinder understands the burden of inequality of gender, class, caste, and religion and feels that it is constantly surrounding her being. But she isn’t bitter. In Rajinder’s art, she celebrates creativity, whatever the medium. “There are many dreams and aspirations, linked to art,” says Rajinder, who now hopes to have her own studio. Does Gua Sha work as a healing technique?